Jambo & Greetings from Safari Multiways! 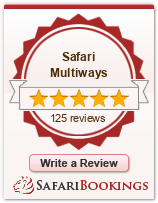 Safari Multiways is Tanzania Inbound Travel Solution Company for the Northern Tanzania National Parks. We provide comprehensive travel solutions for leisure, group, charters & small business travelers. Since its inception in 2010, we have been growing rapidly, aspiring to emerge as one of the foremost travel companies in Tanzania. Fairly young, we are receptive to new ideas, flexible and adaptable to our clients needs. Our Tanzania Travel service is embellished with the very best of tourist destinations, attractions, cuisines and things to do in Tanzania. With our offices in New Arusha, our Tanzanian Tour Operations extend top of the class services to our prestigious customers from across the globe. Keeping in mind the lingual problem of our clients, we have now started providing an in-house Linguistic Trade Guide facility in Russian, Spanish, Italian, German and French. The organization is headed and managed by people with a rich experience in the hospitality industry. We offer all types of packages – premier, standard and budget – with personalized services within Tanzania. We are experienced in providing tailor-made cultural, religious, tribal, adventure, and wildlife tours, along with other basic packages of Maasai Bomas, Bushmen Villages visits and other major tourist destinations in Tanzania. Safari Multiways also undertakes domastic air ticketing as well as charters of flight. We aim to take you to the explored and unexplored parts of the mystical land, Tanzania. Choosing the right Tanzania Tour Operator is a must. Travel to Tanzania to discover every fascinating element of Africa.